They stung like daggers from a vengeful rival, each one sinking deeper than the last. From the corner, off the dribble, on the inbound — it didn’t matter. North Carolina was powerless to N.C. State’s three-point onslaught, as it has been so many times this season against so many teams. By the time UNC surrendered its final three-pointer on Saturday, it was too late. The Wolfpack had already buried 15 threes on 50 percent shooting — both season highs for a Tar Heel opponent — and taken a three-point lead, one that would hold until the final buzzer of No. 10 UNC's 95-91 overtime loss at the Smith Center. The last time these two teams met in this building, North Carolina walloped N.C. State by 51 points, one of 21 victories in its previous 23 tries against its in-state rival. This time, the Tar Heels (16-6, 5-4 ACC) were the ones watching idly as the Wolfpack (15-7, 5-4 ACC) scored nearly half its points from beyond the arc — which made UNC’s 4-for-19 effort from deep look even more futile. This season, Williams’ team has had a tenuous relationship with the former. The Tar Heels rank fourth in the ACC in three-point attempts and makes this season, but in the past three games, they’ve shot 19-for-71 (26.8 percent) from deep. The more pressing issue, though, comes on defense. North Carolina has allowed at least 10 triples in 15 of its 22 games this season, including four of its six losses. After Saturday’s loss, they rank 14th in the ACC in three-point percentage defense and dead last in threes allowed. This loss harkens back to the Clemson game on Jan. 16, when the Tigers cascaded threes against a powerless UNC defense. The Tar Heels won that game, 87-79, but the seams were showing. Then, on Monday, Virginia Tech buried UNC with 12 threes on 40 percent shooting in an 80-69 win over the defending champions. Saturday’s showing was the worst yet, as the Tar Heels allowed 15 threes for the first time since a shocking loss to Belmont on Nov. 17, 2013. It started five minutes into the game, when graduate transfer Allerik Freeman hit a three-pointer off the bench to give N.C. State its first lead. That sparked an 11-3 run by the Wolfpack, which ended the half with six threes on 11 attempts, four courtesy of Freeman, and a three-point deficit. It got worse for UNC in the second half. After an early second-half turnover by Theo Pinson, Freeman sprinted to the right corner as teammate Torin Dorn led the fast break. Multiple Tar Heels collapsed on Dorn, but they all turned their backs to Freeman, who buried his fifth three in as many attempts. Minutes later, Freeman pulled up off the dribble and hit another, riding the momentum the Tar Heels had gifted him. The Charlotte native finished a perfect 7-for-7 from deep, the best mark by an opponent in UNC history. How do you contain a guy like that? 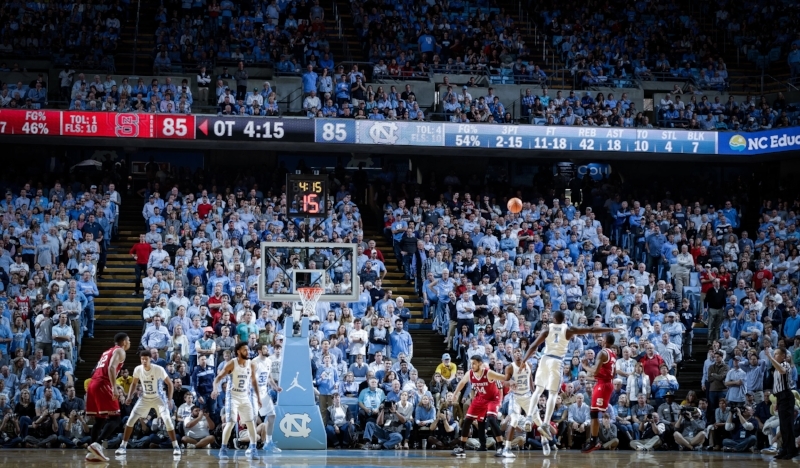 The Tar Heels couldn’t stay close enough to any of N.C. State’s shooters on Saturday. They built a six-point lead, their largest of the game, with 6:32 left in the second half. But a minute later, Joel Berry gave Braxton Beverly too big of a cushion from three on an inbound play. Everyone in the arena knew what was coming next. They knew with a minute and a half left in regulation, too, when Markell Johnson drove into the teeth of the UNC defense, down three. Berry and his teammates swallowed up Johnson, leaving Dorn wide open in the left corner for his fourth three and Johnson’s 11th assist. Roy Williams opted to start switching screens late in the second half, hoping to avoid giving N.C. State enough space to shoot when his defenders went under a screen. But Luke Maye, at 6-foot-8, couldn’t keep up with the Wolfpack guards. Simple isolation defense wasn’t working, either, as N.C. State hit enough heat-check threes to burn UNC's guards on the perimeter. All told, four N.C. State players — Freeman, Dorn, Beverly and Johnson — each hit multiple three-pointers. Only Maye, the Tar Heels' sharpshooting big man, did so on the other side. Maye said his team’s small-ball lineup — which features him at the center position surrounded by Berry, Williams, Pinson and Johnson — is still trying to work out the kinks on defense: when to switch, when to hedge, going over and going under. That starting lineup ripped off four straight wins after debuting against Boston College, but the shooting has run dry while the defense has been hosed by three-pointers. Conventional wisdom says a team’s three-point defense is best measured by percentage, but that’s often more a function of opponent skill than defensive technique. Instead, attempts allowed becomes a safe barometer. It’s simple, really: players don’t often attempt heavily contested three-pointers, at least not in college, so denying looks means denying threes. That’s where North Carolina is weakest. The Tar Heels allow the most three-point attempts in the league, by far, and they haven’t led by wide-enough margins to excuse it away as desperate chucking from trailing foes. They’ve allowed at least 30 attempts in three of the past four games — including in their two consecutive losses. Is it correctable? Sure. UNC's guards have cheated off their man a few too many times this season, an easy mistake to highlight in the film room. And North Carolina's interior defense, while suspect, is capable enough to avoid five-man meetings on every opponent's drive. But it wasn’t remediable Saturday, when N.C. State’s three-point barrage snapped UNC’s 15-game ACC home winning streak and left the Tar Heels tied with N.C. State in the ACC standings, four games behind No. 2 Virginia (20-1, 9-0 ACC). Hours in the gym might be enough to fix UNC’s shooting woes. But time can’t chase an opponent off the perimeter. At this point, the Tar Heels can’t, either. Words weren't enough after UNC men's basketball's stunning loss to Texas A&M in the second round of the NCAA Tournament.